If you have a smartphone, you probably know what apps are -- but did you know they can actually help to make caregiving more manageable? A smartphone is like having a mini-computer with you at all times -- and the best caregiving apps help manage the many aspects of care that barrage and overwhelm most caregivers on any given day. Caregiving apps can help you maintain and update important information, get appointment and medication reminders, keep a log of activities, coordinate various caregivers, jot down notes from doctors or other care providers, and stay in touch with and pass on updates and photos to family and friends. The world of caregiving apps is growing, and it needs to. Caregivers need every tool at hand to manage all that caregiving throws at you. We've compiled a list of some of the most impressive and helpful apps for managing a loved one's care. Disease-specific apps (for those with a loved one who has Alzheimer's, cancer, heart disease, or diabetes, for example) are also available. You may find that a single app doesn't offer everything you need, so be sure to try a few. Most are free, or quite reasonably priced, and they can help make your caregiving life much easier. CaringBridge is just that -- a bridge that allows you and your loved ones to stay in touch. It's a perfect app for a family that rallies around a loved one in need of care, and for those who are facing surgeries, rehabilitation, and procedures that go along with conditions such as cancer, heart disease or diabetes. The app offers a space for multiple caregivers and family members to share pertinent information, such as updates, encouragement, and arranging care. There's a guest book offering a place for journal entries, medical updates, photos, stories, and tributes. This is a wonderful addition to caregiver apps and unique in that it creates a place for more than managing a loved one's care -- you can uplift, stay in the loop and help each other through a difficult time. CaringBridge specializes in keeping loved ones connected. By focusing on this important goal, the app's designers have created a product that not only passes along information but is also a holding place for good thoughts, encouragement, and photos as well as medical and caregiving updates. These features make CaringBridge a uniquely thoughtful and comprehensive tool. Lotsa Helping Hands is a caregiving app that helps you create a community of care around your loved one. You can invite family, friends, volunteers, and care aides to join and then manage everything from sitters and errands to appointments and family gatherings using an interactive calendar. There's also a section of the app called "Helping Hands," which serves as a message board and a well-wishes wall where caregivers, family, and friends can leave messages of encouragement for the person receiving care or for someone else in the care circle. This app lets you choose a coordinator and a community member page where you can update contact information, birthdates, and list best times to call. These features make Lotsa Helping Hands a good resource for creating a vibrant care community. Lotsa Helping Hands has much to offer caregivers and their loved ones. The webpage offers real support, stories from other caregivers, a newsletter and additional features that complement the app. The Caring Village app is designed specifically for family caregivers to help them easily coordinate and keep track of their loved one’s care. Caring Village CEO and Co-founder Mike Behrman says he was inspired to launch the app after he and his wife became caregivers for his mother-in-law, who has dementia. “We realized that the most important thing we needed to do was communicate effectively with other family members, her care professionals and neighbors,” he said in a news release. The app is meant to enable family caregivers to do just that via a secure messaging system where users can create "villages" among friends and relatives to help coordinate the specifics of a loved one’s care. Caring Village users can create customizable care plans for their loved ones plus personalized to-do lists. The app’s features also include a centralized calendar, document storage, a place to list medications and a wellness journal that allows you to share entries with the rest of your "village." CareZone is another great, free care-based app. You can keep all of your loved one's pertinent information on the secured app and invite family and friends to view and participate in his or her care. It has a place for notes and observations, a task list, medication logging (including pharmacy numbers, dosing, prescribing physicians, etc. ), a place to upload photos -- and you can even send a voice message to up to 100 recipients. That's one impressive app! For a free app, this covers most of your informational bases. It's excellent for storing and sharing information – and for knowing that it's secure. CareZone isn't just a caregiving app; family members of all ages can use it. eCare21 provides round-the-clock patient monitoring through wireless and wearable devices (such as a smart watch, Bluetooth, or FitBit device. You can track the wearer's glucose, heart rate, activity, medication, weight, calorie intake and sleep. You, your loved one, other family members and doctors can access this useful information no matter where they live or work. eCare will be most helpful for caregivers as they manage their loved one’s schedules and meet their health needs, but it may take several apps or websites to tackle more complex caregiving challenges such as pain management, medication interaction, financial and end-of-life issues. Any caregiver knows the frustrations and concerns involved in medication management. You have to remember when the medication should be taken, whether or not to take it with food, avoiding double dosage, any side effects to watch out for, and make sure to track the medication for benefits or drawbacks. Medisafe Meds & Pill Reminder can help alleviate some of these concerns with reminders, helpful and practical information, and connecting caregivers, seniors, and the medical community together to provide cohesive care. While some users noted frustrations with loading several medications at various time intervals, it should also be noted that MediSafe receives high marks for customer support. Each online review concern is addressed by the app's support team. Medisafe is unique in that it's not only a medication reminder but also educates people about their condition and the medicines they're taking. Medisafe can help to remind, track progress, and will even find coupons and other incentives. 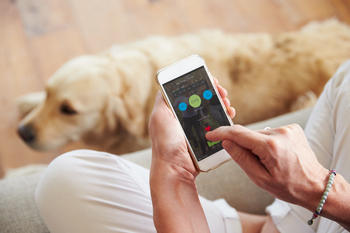 Medisafe is designed for users of any age, for caregivers involved in medication monitoring, and is also beneficial for physicians who want to connect with their patients through the Medisafe aApp. Medisafe has been featured on CNBC and in Reader’s Digest. Have you found other apps to help you with caregiving? Let us know in the comments below!